Over time, rebar that is exposed to deicing salts or marine environments can corrode. An epoxy coating protects reinforcing steel bars from corrosive conditions. 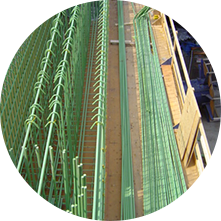 Epoxy coated rebar is ideal for bridges, parking structures, pavement, marine structures, and repair work. Re-Steel’s epoxy coating facility, Corrosion Control, Inc. has the capacity to meet your needs. Strategically located next to a major steel mill of reinforcing steel, our downstream operation coats rebar in large volumes at an impressive rate. However, since we don’t believe in sacrificing quality over quantity, we have an Epoxy Coating Certification from the Concrete Reinforcing Steel Institute (CRSI) that we strictly adhere to. Enhance the lifespan of rebar with epoxy coating.